Earlier this year I was asked to make an index for a baking book written by a YouTuber (yes that is a word, it’s in the dictionary). So I did the job and ended up a bit puzzled. There were plenty of recipes for cakes, cookies and cheesecakes, but they were a bit ‘easy’, no complicated techniques, no hard-to-find ingredients, not many flavours, and I wondered faintly why anyone had bothered to make the book. So I put the work behind me and got on with other things and wasn’t even tempted to try making any of them. Last Friday, 1st July, while Britain and Europe were still reeling from Brexit, I was labouring over an index for a book about medieval trade across the North Sea, and on the day the destruction of the Somme was remembered (wasn’t #wearehere fabulous? I wish I’d been able to see some of the young men myself), Tanya Bakes was launched. And I finally got why the book was written, it’s not a book for my demographic at all, it’s a cookery book for people who want straightforward, simple, feelgood recipes, with nice pictures. It’s for girls (and boys) who want to thank their mum or dad or sister, or nan or uncle or teacher and make them a few cookies. It’s for friends who want to spend an hour together to make something before settling down to watch a movie. It’s for anyone who wants to make cheesecake or party pudding or a cake you can stick sparklers in. There’s not much in the way of fancy icing to be done and it shows it is OK to put sweets on cakes if that’s what you want to do. If you want recipes for Nutella or put peanut butter in something, you’ll find something to help you. Twitter went mad. #TanyaBakes was used by people expressing their excitement at having received their copy, saying they were going to one of the book signings she has arranged, and more importantly perhaps, showing off their bakes. So it’s not my demographic, but I’ve got to congratulate Tanya if she encourages people to try a few things for themselves. It’s not a book to grab and use every day, I had to laugh a little at the person who put a review on Amazon complaining about the amount of sugar, but in moderation it has got good points. And I made some brownies. Tanya’s most ‘exotic’ recipe uses coconut sugar and coconut oil, I swapped that out for brown and white sugar and some butter, but I did put in the half an avocado. Here’s a piece with some raspberries out of my garden and a bit of cream. Haven’t we all said that and apparently although Burton’s say it is to do with the size of our hands getting bigger, not their snacks getting smaller. As with many snack foods the apparently the sizes vary in different countries – my how we laughed when we encountered a six-finger Kit-Kat in the USA a few years ago. But it’s my husband’s birthday, so as a special treat I have hunted down a recipe for do-it-yourself Wagon Wheels – thank you to Kitsch in the kitchen for a recipe. And supersized them by using the largest round biscuit cutter we had. I used Galaxy chocolate for the coating and some home-made raspberry jam in the middle with the marshmallows. The bit with the marshmallows went a bit sticky, so there’s no pictures of the making, just the finished results. 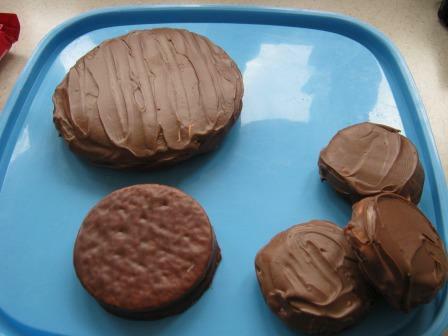 Picture below shows one ginormous biscuit, a ‘real’ Burton’s biscuit for comparison – you can almost see through the chocolate flavour coating on that one and a few small ones that I made. A lesson learned the hard way. Even the best recipes can sometimes go awry. Last week I was trying out the Cinnamon and Raisin Flapjacks with White and Milk Chocolate Topping in Pat Ring’s Cake book that I mentioned in a previous blog entry. I love eating flapjacks but seldom find recipes to my liking because the result ends up too hard and crunchy or two chewy or doesn’t cook or some other disappointment. So there I was following the instructions to the letter. The flapjack bit was easy peasy, with the usual butter, golden syrup, sugar, flour, oats, raisins and as secret weapons some vanilla essence and some ground cinnamon. The topping was to be melted chocolate with added vanilla extract. Now as ‘any fule kno‘ adding liquid to melted chocolate is going to lead to disaster – seizing up of the liquid to a chunky mess. And I’d even read the bit in Pat’s book about not doing it! I was using a brand she recommended as well, so in for a penny, in for a pound I added the requisite vanilla extract to the melted chocolate, and low and behold both the milk and white seized hard and fast. I had to melt more for the flapjack topping and didn’t add any more essence to those batches and just spread them. No pictures now exist but the result was rather yummy and I’ll definitely do the flapjack again, and might even go for the ‘without vanilla essence topping’. There I was stuck with about 200g of seized chocolate. What to do? 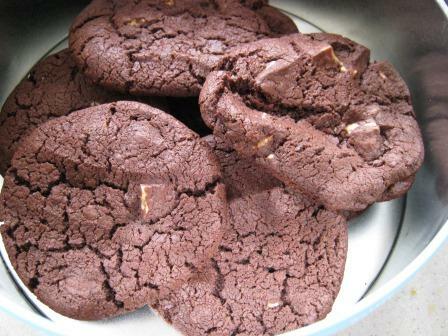 I Googled a bit and found a) that it is impossible to retrieve seized chocolate (no sh!t Sherlock) and b) a recipe that suggested using the seized chocolate in cookies. Aha! So I kept the bowls of seized chocolate to one side and once the flapjack was gone I set too and chopped up the seized chocolate mixes for cookies. Thank goodness they worked OK. The result was a bit less regular than the usual ones (recipe over here), but they taste just fine. I’ve decided to practise what I preach and try and sell some baked goods to local people. I’ve made my facebook business page, so if there’s anyone out there reading this, please take a look and give it a ‘like’. I’m sorry, you can only order if you’re local enough to collect or for me to deliver. I have a blog to write later about Christmas pudding, but you’ll have to wait for that while I do some other chores.